AN UNTIMELY FROST by Penny Richards is the first of a new historical sleuthing series set in Chicago during the late 19th century. 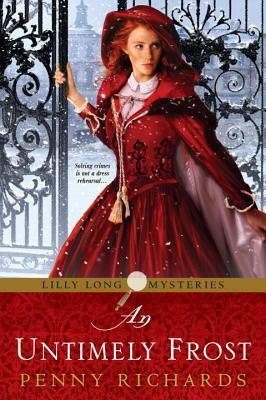 Lilly Long is an unlikely heroine in that she's an actress by trade, quite naive, and recently scorned no thanks to her handsome but double-dealing husband. Reeling from the demise of her marriage, Lilly applied for the position private investigator with Pinkerton, an established and quite popular detective agency, with the hopes of finding her husband and/or help other women like herself find justice after being taken advantage of by men. Lilly Long have a few elements that I love, aside from the setting it screams feminism from Lilly's chosen occupation to the first case it took. I also like the juxtaposition of Lilly's character, it promises a lot of room for character growth as the series moves forward. As for the plot of AN UNTIMELY FROST, it wasn't much of a brain teaser in that PRichards didn't do a lot of foreshadowing nor was the setting atmospheric. The story, IMO, focused more on Lilly and her skill as a newly minted detective rather than the actual case of the missing Preacher and his family. I liked this debut enough but I wish there was more action, near-misses, daring feats, and maybe brighten up Lilly's character. Lilly's okay but she wasn't unforgettable at this point. That said, I might check out the next book just to peek at Lilly's growth and hopefully it'll be more exciting and can give me a good adrenaline rush. I can see why you picked this up based on that description, I would have as well. Wonderful review for this, it sounds like it was kind of middle of the road but still a good one. I definitely like the sound of Lilly's character! Here's hoping that it develops a bit more in the sequel and that the next book also delves into the case a bit more, too. I can totally understand why this and her her character left you wanting more. Hopefully the next book is a bit better. Seems like it could have been much, much more! The blurb definitely grabbed me and it doesn't surprise me about the focus being on Lily herself. Maybe now that the introductions are out of the way, the second story might be more focused on the mystery for you. I have yet to pick up one of these historical detective novels and been impressed. They are okay but never wow. Thanks for sharing. I do like the premise, but that's a bummer this one didn't focus that much on the mystery! The synopsis had me giddy..your review not so much. However, I will watch to see if book two delivers more of what I think we would both want! Not sure this one is for me, even though I love this genre. The setting is an interesting one. I do like reading that time period. Nice cover, too.